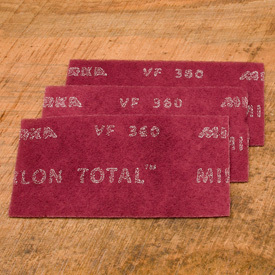 Mirlon Total™ Scuff Pads are made of a flexible, non-woven material with strong, long-lasting fibers that don’t load like traditional sand paper or tear apart like steel wool. They can also be used for wet or dry sanding, are unaffected by water and lubricants and can be washed as needed to remove debris build up. Mirlon Total™ pads are highly flexible so you can sand contoured surfaces including beads and coves quickly. They can also be trimmed to size using scissors to suit your particular requirements. The 360 grit (Very Fine) replaces "00" steel wool and can also be used for general sanding and surface preparation including removing raised grain after applying a seal coat. The 1,500 grit (Ultra Fine) and 2,500 grit (Micro Fine) are recommended for sanding between finish coats to remove dust nibs as well as "rubbing out" or polishing leaving a silky smooth surface.